Polenta is one of my best loved dinners and I enjoy it served creamy and cheesy, delicate and sweet, as well as complex and hearty. This polenta recipe is a bit hearty and crowned with a fresh parsley pesto and cherry tomato sauté. I particularly enjoy Bramata polenta. It is a rustic stone-milled corn which is moderately coarse for a thicker consistency. My first polenta dinner was quite an experience. I had a friend over who wanted to prepare a classic dish he had as a child growing up in Italy. In my friend’s opinion the only way polenta should be eaten is with a rich meat sauce. His plan was to prepare Polenta with Chicken Livers. Once the polenta was cooked it was poured directly onto my dining table and topped with the chicken liver sauce. Although I was very impressed by the presentation, I do not have the palate for chicken livers so I kept trying to scrape the edges where the sauce didn’t touch. Even without the sauce, I was captivated by the creamy texture and tiny bits of corn meal similar to the grits my mom would prepare. Throughout the years I have formed my own opinions about preparing and serving polenta. When cooking polenta, for added flavor I like using broth rather than water. Sometimes I add a few tablespoons of rosemary. I always include butter and when I am preparing a savory polenta a nice grated parmesan. To top it off…tomato sauce, pesto, honey and butter, or simply a handful of parmesan and a drizzle of olive oil. In a large pot heat 6 cups of broth. When the broth is about to boil, sprinkle in the polenta. Stir continuously over a low heat until it is a thick smooth mass. Continue cooking on low heat for about 40 minutes, stirring slowly and evenly. If polenta starts to spatter turn your heat lower and stir continuously until it settles. I usually stir once every 3-5 minutes until done. While polenta is cooking prepare pesto. Place all pesto ingredients in a food processor and whizz until well combined. Set aside. Place a non stick skillet on the stove with 2 tablespoons olive oil over medium high heat. Saute’ tomatoes for 2 minutes until soft. Season with a pinch of salt. Once polenta is cooked add butter and parmesan, mix well and pour onto a large serving platter (or directly onto your table!). Top with pesto, tomatoes, grated cheese of choice and serve right away. This sounds really good! I’ve never made a polenta dish, so I will have to try this! Amazing! I’ve only ever tried polenta here in Argentina where it’s usually served with tomato meat sauce (at least that’s the way Juan’s mum makes it). But I’d love to try it with pesto! Oh, beautiful pesto! And the tomato sauté you introduced sounds amazing as well! thanks so much for sharing my dear, have a great week! Delicious looking polenta. I must try it in it’s softer form. I tend to make a loaf and toast it. It is made the same way as the porridge but cooked a little longer. The bread (I have done) uses finer flour. It is delicious too. Hi Anne! Great to hear from you and I have been enjoying your updates on your blog. Your little girls are adorable! :) I’ll have to try this with sage brown butter, sounds delicious! Your new city seems to be treating you well! :) Take care! Thanks for the story. It made me chuckle as I remembered some of my own chicken liver stories … and of course, a good polenta dish is always a good thing. Ha! Chicken livers…. never will be able to enjoy them! Yum…cheese and mushrooms would be fantastic on polenta. Doesn’t really require much…I love it too. I hadn’t heard of Bramata before. I’ll have to take a look next time I’m at the store. This particular brand was especially good (Moretti) I felt like it really changed the flavor with the grain being so rustic and coarse. Cooking time was a bit longer. I think it was well worth it. Especially compared to the flavor of a quick cooking polenta. Mmm.. this sounds great. I confess to being a polenta-cooking virgin which is silly when recipes such as this are around. I must, must try it! I too love polenta, I also never heard of Bramata but will try to locate some. Have seen them pour the polenta out onto a cutting board or something to serve, very dramatic. I’m with you on the chicken livers, love what you did. I’ll take it that way any day. I love polenta! Your version looks so good. My Grandfather brought a copper polenta pot back from Italy some 50 years ago. It’s now in my kitchen. Oh my….a 50 year old copper polenta pot!! I would love to have one. What a treasure! I would love to see a polenta post from you! Mmm. Love polenta. Especially chips made from leftover polenta the next day. The perfect excuse to make an extra large batch of polenta in the first place. I think I might just take you up on that challenge. They are so delicious. And not too difficult to make once you know how. Perhaps next week. 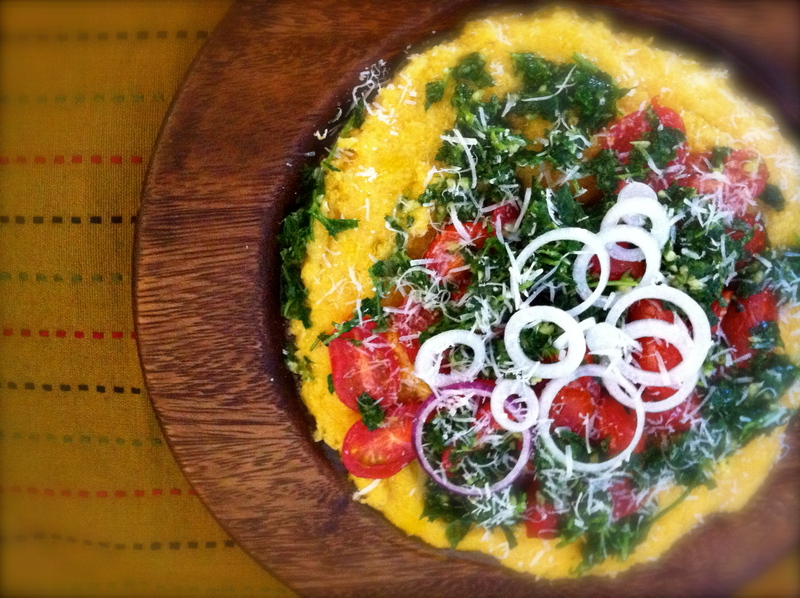 Yum – I cook with polenta a lot. Do the standard wet polenta with mushroom ragout and each morning I have a sweet polenta (use water and milk) with blueberries (or other fruit) and sometimes with honey drizzled over. In fact I might pop off and make some now! Thanks! I just took a look and it looks fantastic. I love polenta, even the instant product has great appeal when well seasoned, soft and creamy. Polenta is similar to Romanian mamaliga and we eat with with sour cream and cottage cheese. That’s my favorite way to eat it, but this tomato sauce looks delicious! Beautiful! I will try the leftover polenta with this recipe :-) , I read or dreamed that sometimes they cook polenta in Milk? Or did I really hallucinate that? Agreed on the chicken liver! Never had polenta, and I’d definitely like this-love the parsely pesto. I just tried this last week and was surprised the amount of cheese, cream and butter that was needed to make the polenta tasty. Yours look so good! It is true. What type of sauce did you use? I know polenta can be bland (of course as any grain) and it does require a bit to bring out the flavor. Not the kind of dish you’d make if you are watching your intake! I didn’t specially make a sauce for it but top it up with my meatballs in tomato sauce. Ooooo. Sounds delicious. Hope your enjoyed the polenta. I love polenta in the winter. During the summer, I grill it! LOVE it! Yours looks beautiful, perfect for summer! I adore the textures and flavors in this recipe. Pinned it – it’s a keeper. Great job! ! ! Beautiful! I just made polenta but not half as pretty as yours! The combination of colors and textures is truly lovely! Thank you! You are currently reading polenta at COTTAGE GROVE HOUSE.